The Denver & Rio Grande Western Railroad was among the first railway companies established in the western portion of North America. From 1870 the Denver & Rio Grande Railway established a large network in 3 ft gauge to connect Denver in Colorado with Mexico City. In 1901 the railway merged with the Rio Grande Western and received its new name which lasted until the company was sold to in 1988. 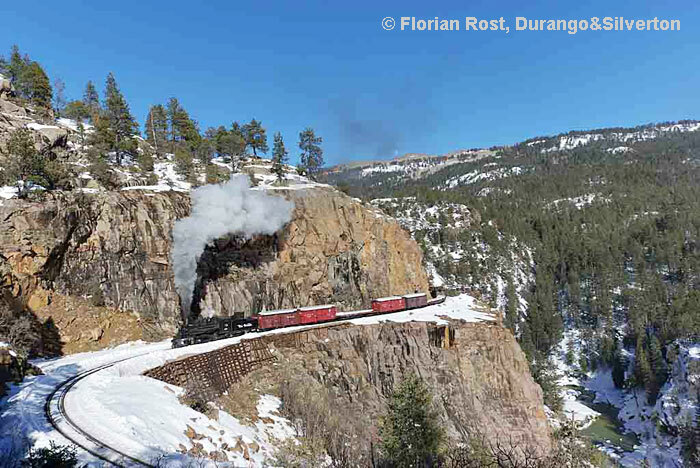 The railroad lines through the Rocky Mountains were (and still are today) spectacular. 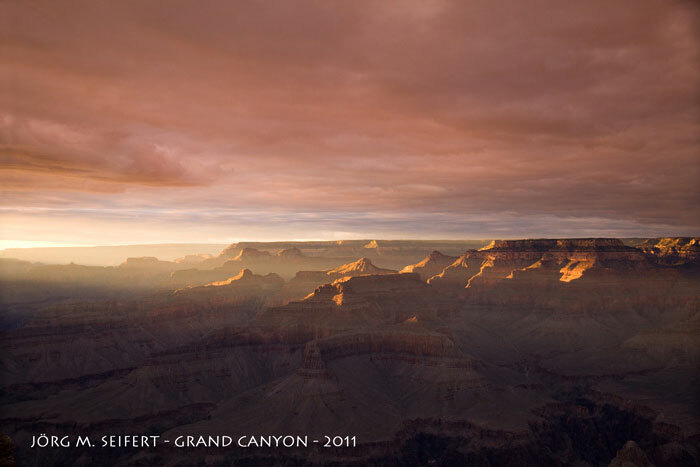 They soon became a tourist attraction in addition to being a common carrier. In the early 1950’s, faced with declining revenue, the railway board decided to paint the passenger coaches yellow on some lines to help promote more tourism. 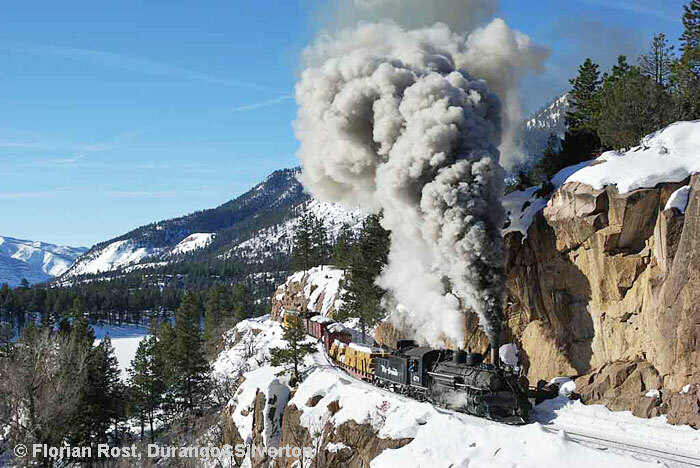 However it was not enough and as freight traffic fell away to almost nothing and the lines were closed leaving just two of the most spectacular scenic sections as tourist only lines: These sections are, from Durango to Silverton and Chama to Antonito. Both lines still have a number of serviceable, authentic freight wagons in addition to their large, noisy and powerful steam locomotives. 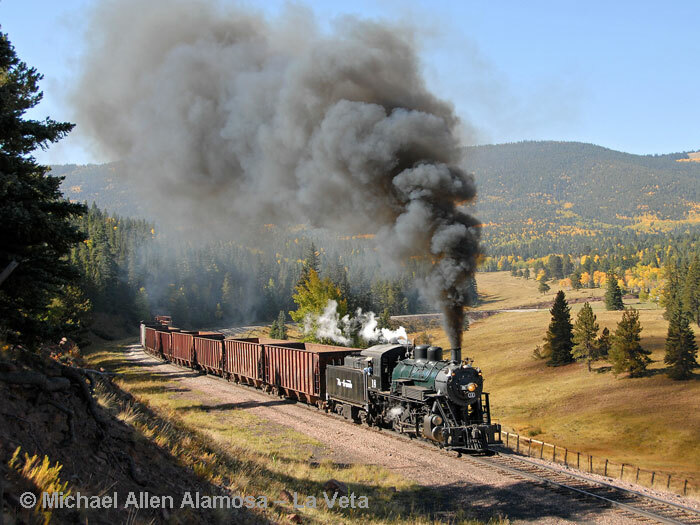 Additionally, the Rio Grande Western standard gauge line over the La Veta pass is still in use today for freight traffic. 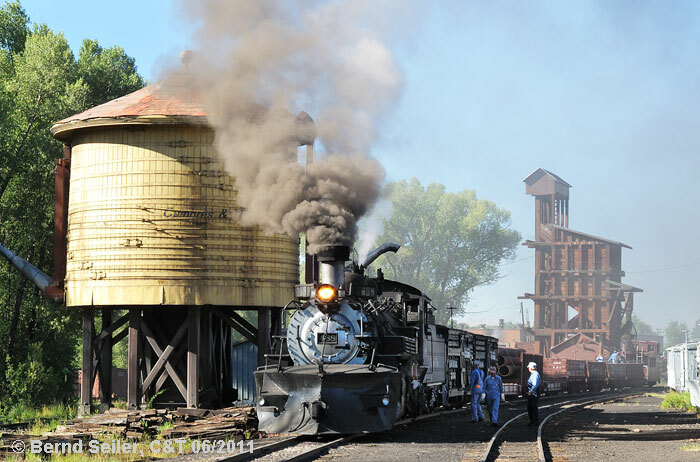 The line has an operable 2-8-0 locomotive which we will use to haul our freight train. On all three railways we have chartered several authentic looking freight trains. 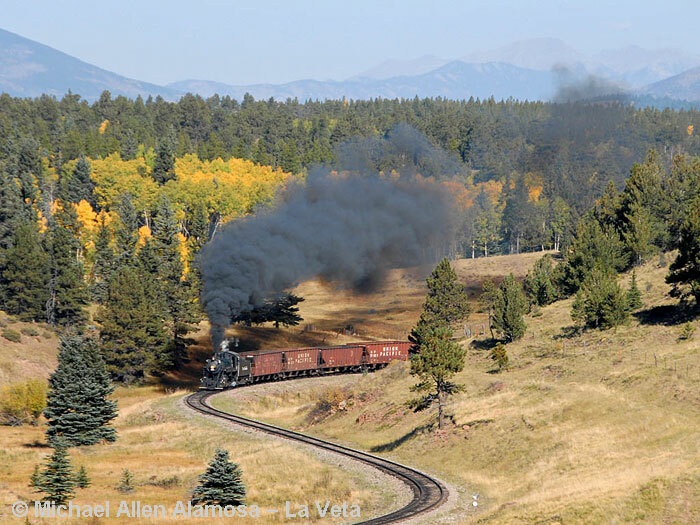 At the La Veta pass we will run two trains, our freight train and a diesel-hauled chase train. This is to avoid a non-authentic mixed train. Travelling in freight wagons is not allowed this rule makes this arrangement necessary. Of course, this adds much to the cost of the tour. We however, will not settle for less to realize a working solution for you when this is likely a once in a life time visit . On both of the narrow gauge lines, to maximize the experience and enhance the photographic potential, we will use almost everything available from their rolling stock inventory that has a licence to roll. The locomotives already look really authentic, they are dirty from their daily use, not the usual super-shine museum railway pets that we’re used to seeing today in Europe. The railways use the locos almost daily for their really challenging tourist service, often very hard, at the limits of adhesion. 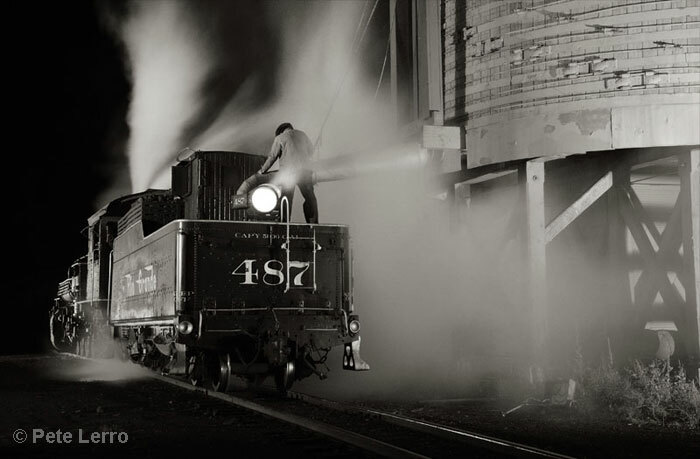 For the planned night photo shoots, we will work together with the well known photographer Pete Lerro. 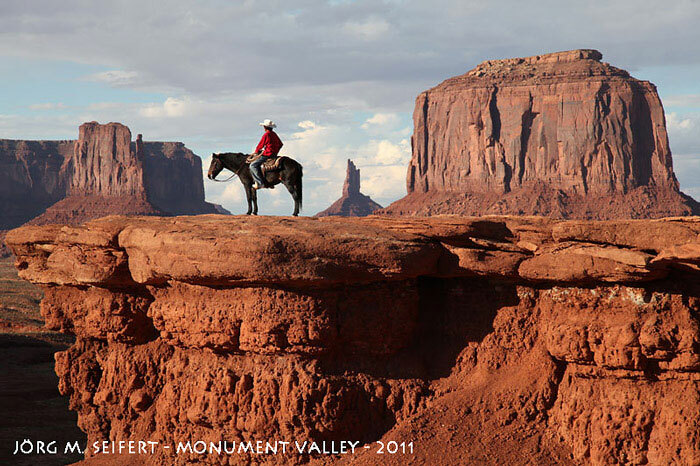 When traveling so far, you should not miss the stunning vistas of the Grand Canyon and Monument Valley. We’ll spend a night at both. 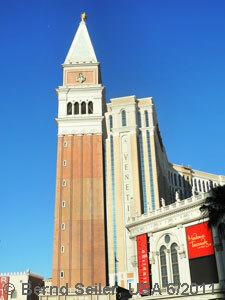 Additionally, we have added the incredible city of Las Vegas to the program. Rather conservative thinking people can’t understand what they have built in the middle of a desert. It’s so abnormal that it becomes interesting again. 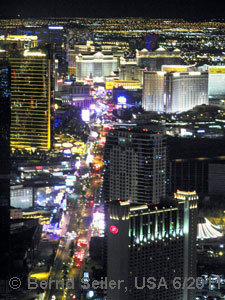 The Monorail is one of the most traditional enterprises there, but mainly they make their money with gambling and in the horizontal business which is permitted in Nevada. On the other hand you’ll get high standard hotels for a bargain and, good food. The latter is not that common in the U.S. 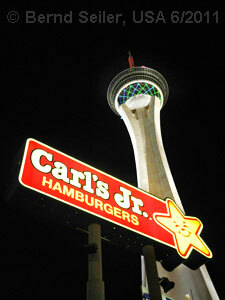 It doesn’t take wonder that a commercial empire started its career by selling unhealthy, fatty food from here. 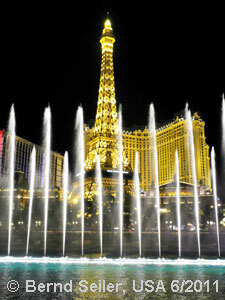 Whatever you may think about Las Vegas, it’s a place you must see. It’s a mirror of a certain society and it’s impressive! Arrival in Europe, Australia, etc. 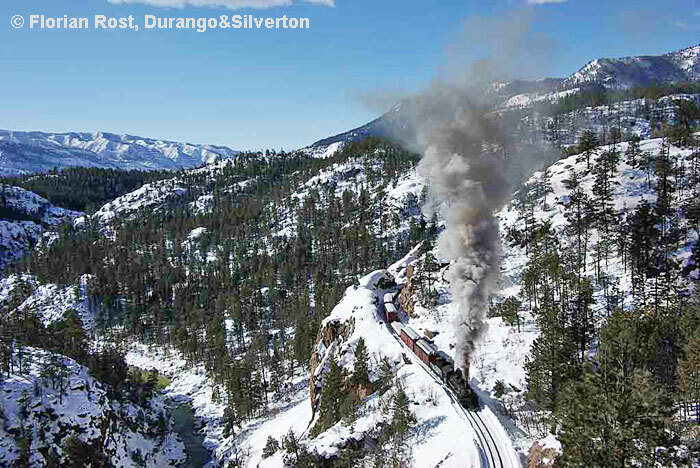 Between Durango and Silverton we’ll use the line from Durango  Elk Park (shortly before Silverton). 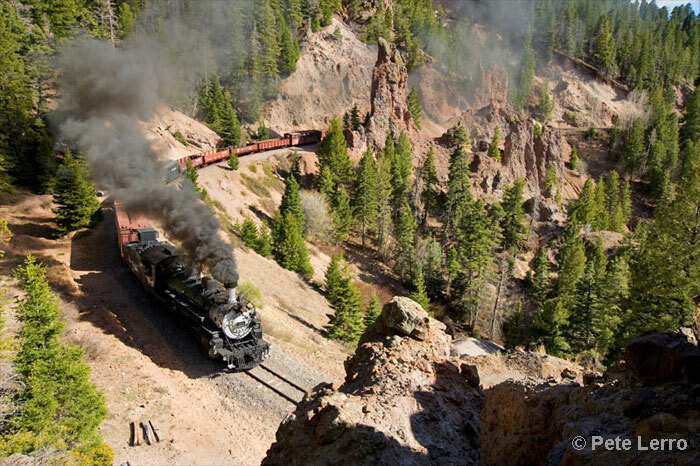 We have booked a pair of freight trains up to Elk Park in addition to another freight train as far as the Cascade Y, taking in the section north of Rockwood with the grandiose gorge below, called the “high-line“. From Walsenburg (Colorado, south of Pueblo), the D&RGW erected a narrow gauge line westbound over the La Veta pass. In 1878 they reached Alamosa. 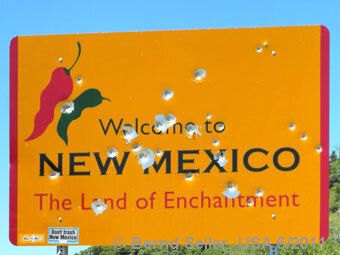 From there they built a line southbound to Antonito where they established a connection to the Santa Fe (New Mexico). These lines were re-gauged to standard gauge in 1899. The narrow gauge was abandoned in 1902. 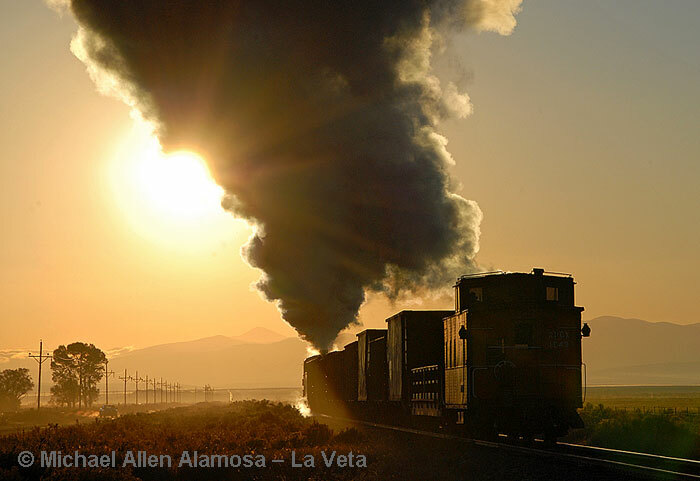 The line from Alamosa over the La Veta pass offers beautiful vistas of the mountains in the distance. In the Autumn they are often snow capped. Many curves and S-curves offer a good photographical potential. Near the pass you’ll find a horseshoe curve with a former cattle loading point. The line also has some tunnels, but admittedly, they are difficult to photograph. From Alamosa the D&RGW extended their network westbound. The line had to be laid over the Cumbres pass at an altitude of 3.052 metres above sea level. For trains climbing from the south, this pass was, and still is, a real challenge, one of the most spectacular in the World. 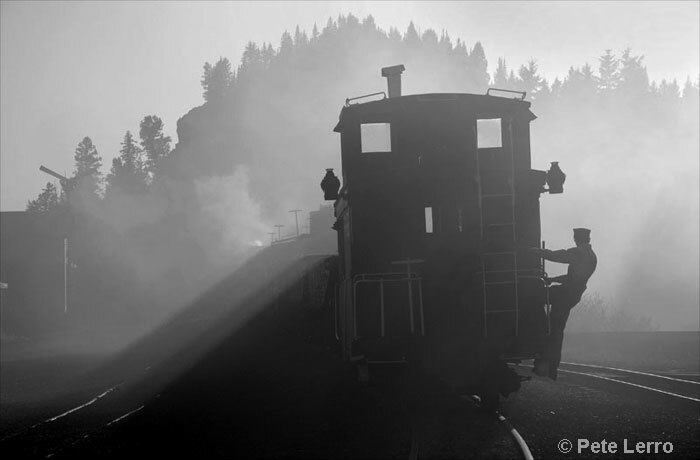 Often two or even three locomotives were required to bring a train over the pass. Not much has changed on this section today; the locos still let the ballast dance under their heavy exhaust beat when fighting against the gradient. The landscape on this line changes from east to west enormously. This is one of the reasons for the almost unlimited photo/video opportunities and why we have planned five days of activities. We won’t run trains every day from sunrise to sunset because in the first three days we need to accommodate the regular service trains on the line. We also need to follow the maximum 12 hours on duty rule for the crews. The railroad runs two tourist trains per day. We have worked our schedule around those trains. On the last two days we will be the only train on the line. 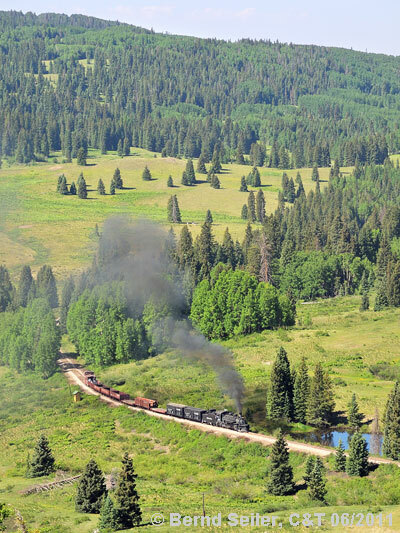 The line from Antonito, via Chama to the west, reached Durango in 1881. 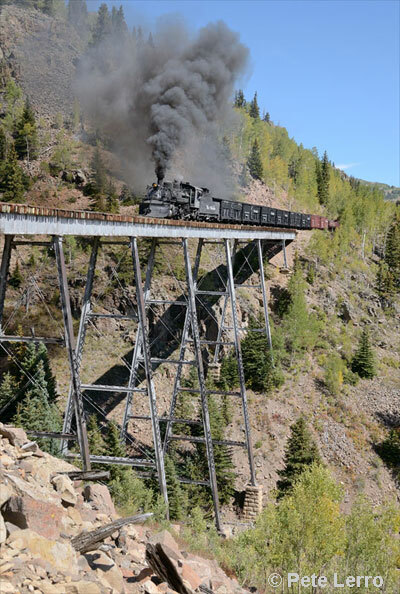 To gain access to the Silver mines north of Durango, it was necessary to build the railway along a gorge and through a narrow valley. During the construction, the famous “high-line” was blasted out of solid rock. Deep below the high-line you can see the crystal clear Animas River which featured in the movie “Butch Cassidy & the Sundance Kid”. The railway follows the river for almost its entire length and crosses it several times on sometimes scenic girder bridges. Silverton the northern terminus was reached by 1882. 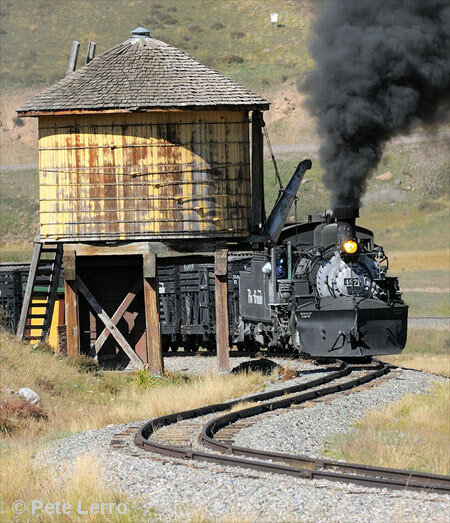 The importance of Durango for the railway can still be imagined by the round house with turntable. We plan to take some (night) shots here. There is an excellent museum in part of the round house. The lines we’re travelling to offer such a huge variety of scenic views that, although we are spending so much time there, we’ll be unable to photograph at every possible location. We are limited by the time we have and the money we can spend. Adding more would burst the finances of many who might be interested. The program has been set-up locally with the responsible people from the railways involved back in June 2011. You can expect a professionally arranged tour. While the track condition on our lines can’t be compared with a Swiss museum line the tracks are still the same as they have been for many decades. Derailments are rare but we cannot guarantee anything. You’re travelling on your own risk. Always use common sense when crossing roads and railway tracks. FarRail Tours cannot be held responsible and will not accept any liability whatsoever in the case of any accident or damage. 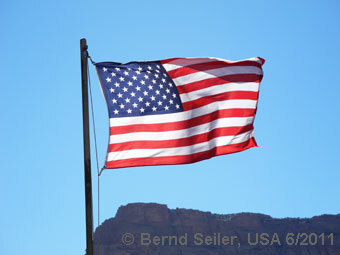 We suggest you take out a comprehensive overseas accident and health insurance policy. Sometimes we may travel in freight trains with no seats. We need to sign a paper which states that the railways do not held any responsibility and will not accept any liability whatsoever in case of any accident, damage or disadvantage. Some of the photo positions are only suitable for a dozen photographers. On such locations we’ll repeat runpasts until everyone got his/her shot. However, most of the positions allow many people to get the perfect shot. The gigantic price the railways asked for are the reason why we need a large group to make the tour affordable. This requires a certain amount of discipline of course. Sometimes our train will not be the only train on the line and we will need to wait for crossings or for trains to pass us. Of course this will present even more photo opportunities. 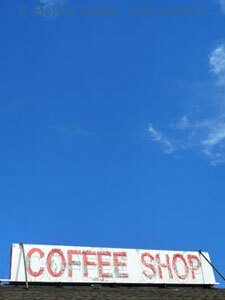 We will plan about a dozen photo spots each day. The itinerary might be altered from that published make the most out of the emerging opportunities. It cannot be promised that everything will run as planned and paid for. Keep in mind these are challenging mountain lines where trees or rocks can fall on the track and can end all our plans. Although the condition of the locomotives is excellent, they are still complex machines which might cause trouble. Hence we can’t guarantee the use of a certain locomotive or rolling stock. But be assured that the railwaymen will try their best to make our tour a memorable event. The highest temperatures can be expected to be between zero and 25 degrees Centigrade. 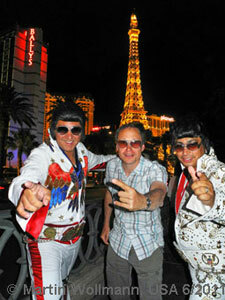 In Las Vegas it might be considerably warmer. While in the mountains, snow is possible at any time. Although the region enjoys some 300 days of sun a year you should be aware that weather conditions can be change in the mountains rapidly with warm sunshine and snow just hours apart. Consider this when you choose appropriate clothes for the trip. 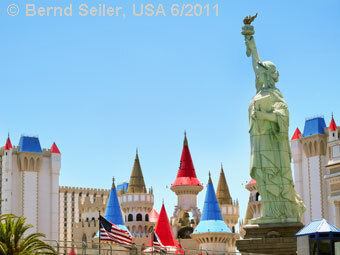 We require a firm booking from anyone wishing to take part as soon as possible and we will require a deposit of £330/€380/US-$500 per person no later than August 12th, 2012. We have to make a substantial non-refundable payment to the railways. 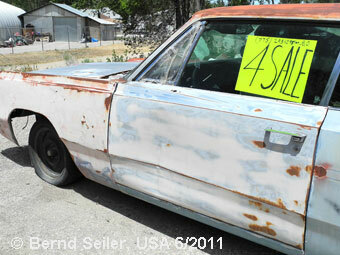 The deposit is under no circumstances refundable after August 14th, 2012. Personal expenses like telephone, laundry, hotel mini bar etc. If you wish to come only for a certain line or day please find the prices below. The prices include all charter trains, hotels, breakfast, sometimes lunch on the train, transfers, and the night shots with Pete Lerro. If you wish to come only for a certain line or day please find the prices below. The prices below are train-only prices without transfers, hotels or any other services. You can book this option (remaining seats) from August 1st.